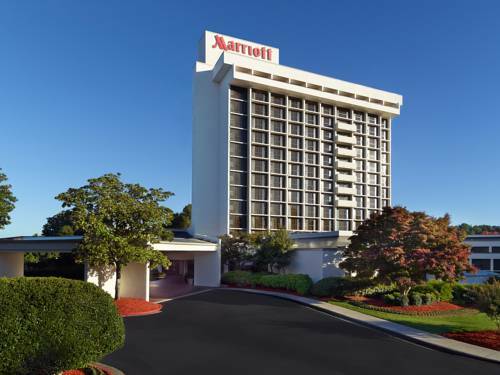 Stroll into Atlanta Marriott Northwest at Galleria and experience our warm Southern hospitality in recently renovated spaces that perfect the art of meeting, dining, relaxing and slumbering. Whether youre popping by for a quick scotch, bourbon or bite at Rocks Bar or savoring a hearty breakfast at The Marketplace, the talented culinary team at our Marietta, GA hotel and Six Flags Over Georgia will tempt your taste buds and leave mouthwatering memories for when you need exceptional catering services to impress business colleagues or dazzle wedding guests. During your downtime, the connected indoor/outdoor pool and state-of-the-art fitness center can provide great stress relief. Our 18 Atlanta meeting rooms and convenience to Comcast, Genuine Parts, Assurant, Allstate, Manhattan Associates, and GE make us an ideal place to stay for busy executives. Also near our Marietta, GA hotel, is the new entertainment district, Battery Atlanta and the new Braves Stadium, Suntrust Park. Rocks, our Northwest Atlanta dining venue, specializes in regionally inspired cuisine and the best scotch and bourbon available. Enjoy intimate casual seating or inspiring communal tables at our hotel restaurant near Cobb Galleria Centre.